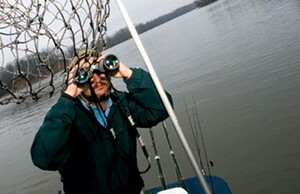 A fishing guide and naturalist extraordinaire, Capt. Mike Ostrander of Discover the James reveals his favorite spots. 1. On a boat at Jefferson's Reach, a five-mile stretch of the James River between the Richmond Yacht Basin and Deep Bottom Park. You can see wild turkey, bald eagles, osprey, foxes, otter and muskrats. 2. From the shore at Osborne Landing. Lots of raptors in the summertime (bald eagles, hawks and osprey), but also a chance to see the rare Atlantic sturgeon breach from the river from late August through mid-October. 3. In the woods at Henricus Historical Park. Throughout this massive park, birders have a field day. 4. Underwater in the James River Park System. Put on a scuba mask and a pair of gloves and you're ready for hours of endless wonderment. Bluegill, red-breasted sunfish, smallmouth bass, gar and catfish can be seen around the next rock.